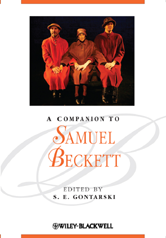 A collection of original essays by a team of leading Beckett scholars and two of his biographers, Companion to Samuel Beckett provides a comprehensive critical reappraisal of the literary works of Samuel Beckett. Builds on the resurgence of international Beckett scholarship since the centenary of his birth, and reflects the wealth of newly released archival sources. Informed by the latest in scholarly, critical, and theoretical debates. A valuable addition to contemporary Beckett scholarship, and testament to the enduring influence of Beckett's work and his position as one of the most important literary figures of our time.